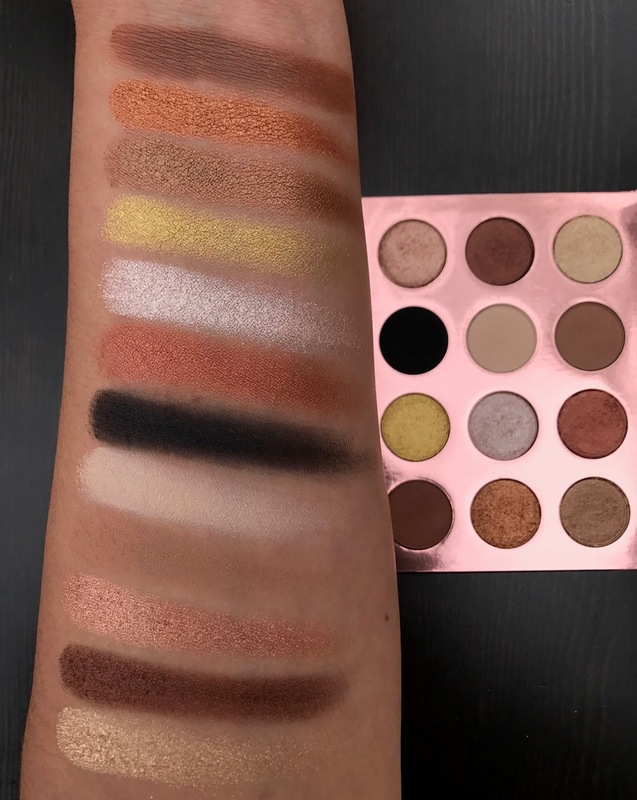 Today I'm sharing the newest ColourPop pressed shadow palette, the I Think I Love You Palette. This little palette is actually going to be included as one of my September Favorites because I am so in love with the shades in here. This is the third 12-pan pressed shadow palette that ColourPop has released and I do think it's my favorite of the three so far. These palettes cost $16, which is an amazing value. Full-sized ColourPop pressed shadows cost $6 a piece, though they are always on sale for $4. While these shadow pans are smaller than the full-sized pans, you still get a big bang for your buck and unless you don't own a lot of makeup, you probably won't be finishing any of the pans. Before I begin my review, let me remind you that if you'd like to see reviews of the previous two 12-pan palettes, the Yes, Please! or the FEM Rosa SHE palette, you can find them by clicking the links. This palette is filled with the most beautiful metallics in rusty, coppery, bronzey tones. Metallic shades are my favorite and this palette is full of some of the prettiest shades, my favorite part of the palette and the one I see myself using most is the first half. Aren't these shades amazing? This palette is a true metallic shadow lovers dream come true. These photos don't even do the shadows any justice, the metallic shades are so reflective and shimmery. I shared a video on Snapchat the day I did these swatches, in indoor light by a window and the metallic shades were glorious! 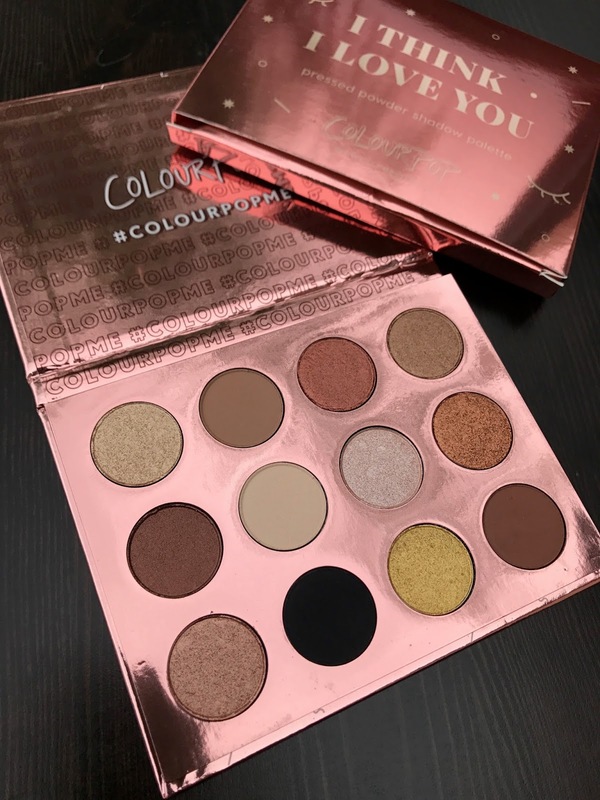 Do I think you need the the ColourPop I Think I Love You Eyeshadow Palette? Yes! The price is so low (my favorite part) and the presentation is very cute, I definitely love the packaging of this palette a lot more than the first 12-pan palette. ColourPop is slowly stepping it up with each of these palettes they release, and I don't doubt that at some point they will include a mirror. As for the quality of the shadows, for me they work really great. The only shade that is a little dusty when I put my brush into the pan is Rowdy, the other mattes are harder pressed and barely release any. On application you do get a little bit of fall-out from some of the shades but nothing major and all of the shadows have a full day's wear time for me. Overall I highly suggest this palette if you're a fan of metallic & shimmery shadows. You really can't go wrong with this price tag and the color story of this palette is perfect for stepping into fall. thank you for this review. i have a ton of neutral palettes but i still want to get this one. the colours are so pretty.